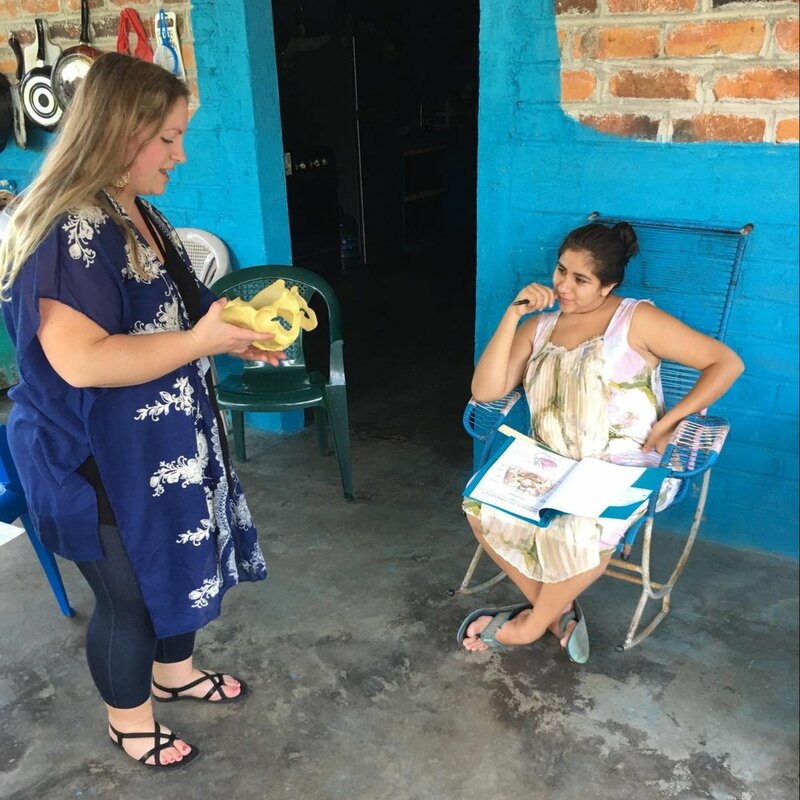 A reflection by Katie Dunning, Certified Labor Doula and Childbirth Educator for NOVA Birth Services, and participant on the Latin America Regional team. In class we demonstrated the contracting power of a uterus, and the relationship between it and baby’s pressure on the cervix, through a balloon and ping pong ball exercise. This can help women understand the relationship between the strength and power of the contractions, and why they experience pain. Just over 2 weeks ago, I was in El Salvador synthesizing what I know about childbirth with the words of Psalm 54:4, to expecting mothers. Elise Gerard, Midwife Apprentice and NOVA Childbirth Educator and myself, co-taught a condensed childbirth education seminar series together. The women we taught included a newly pregnant teen, an expecting mom whose baby’s father recently died, and a gleeful young woman, 6 months in, with the baby’s father in the picture. Beyond providing an education in childbirth, we recognized the value in giving these women room to speak about their unique circumstances and feelings towards labor and delivery. Here, Katie teaches on the female pelvis, and how women can be mindful of certain movements for comfort in pregnancy, but also maternal positions that benefit the position of the baby in preparation of birth. When we first asked our class how they were feeling about birth, one explained that her mother told her that birth “hurt a lot and was ugly.” Her journey into motherhood was already beginning with a negative narrative. Especially for women who anticipate suffering, talking through what goes on in the body during labor can help to dispel some mystery that would otherwise lead to fear. Another expecting mom said that she was afraid, "because the father isn’t allowed to come into the room with me.” Though we know of no law that says it’s illegal for a father to accompany the laboring mother, the staff at the nearest public hospital are known to not allow it on the account of a "lack of space." Regardless of what’s made available to these mothers, they deserve compassionate support and accessible medical care. With all the variables of circumstance and the unpredictability of birth, women indeed need something to hold on to. Isaiah 40:28-31 has a beautiful image of God lifting us. Labor is hard work, no matter what kind of care or knowledge you may have. If our Creator can indeed lift us, and renew our strength, we can press into him with confidence. During the class, we offered our own stories of God’s nearness during birth in an effort to strengthen their spirits, and build their confidence as mothers. In this way, we intertwined their unique moment of waiting on baby, with a history of women overcoming, rising, and surviving childbirth. As these women get closer to delivery, I believe this education will help lift that burden of fear, and give them the strength to labor and speak up for their care. They are seen, heard and valued deeply by God, and myself! I’m thankful for the passionate team of women at G.O.D. Int’l I get the privilege to work alongside in maternal health, and who I will continue to collaborate with to provide valuable resources to these moms, and other expecting moms around the world.